The human journey is brimming with opportunities for growth and development. This volume, crafted superbly by a talented group of young student-scholars at the University of Richmond, explores the myriad ways that human beings have evolved to become extraordinary heroes. There are two types of heroic transformation. The first type refers to the process by which people undergo the significant change and growth necessary to become heroes. This transformation is a personal metamorphosis that often results from setback, transgression, and suffering. 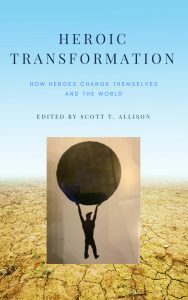 The second type of heroic transformation refers to the hero’s ability to transform society. Once personally transformed, the hero is in a position to make her mark on society. “Transformed people transform people,” as Richard Rohr has said. Most hero journeys feature both of these types of transformations. The heroes profiled in this book who have undergone heroic transformations include Audrey Hepburn, Susan B. Anthony, Thurgood Marshall, Muhammad Ali, Eleanor Roosevelt, Daenerys Targaryen, Dexter Morgan, Frodo Baggins, Bruce Wayne, and many more. This book is now available at Amazon.com. Chapter 2. Elle Woods and the Hero’s Journey: What, Like, It’s Hard?